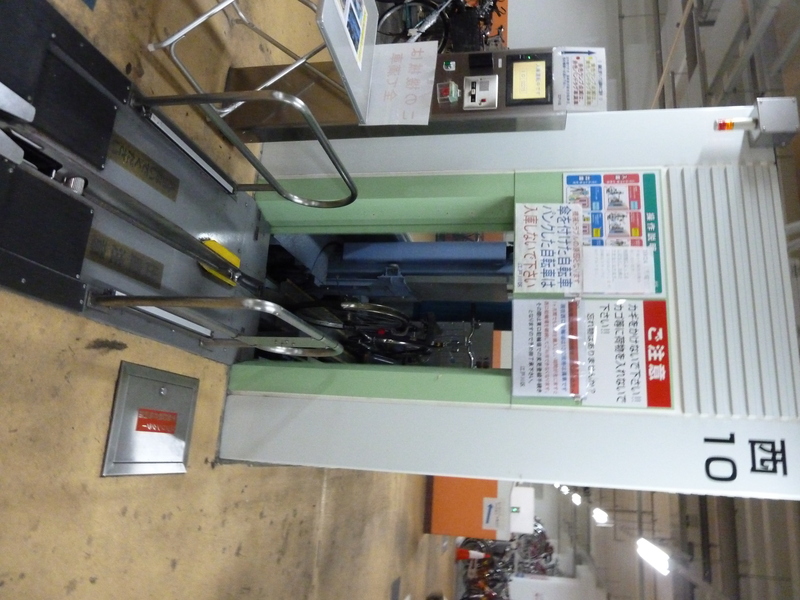 I first read about the world’s largest automated bike parking facility located just outside of Tokyo’s Kasai Station about a year and a half ago on the Cascade Bicycle Club’s blog. I read the blog post shortly after I’d started commuting by bicycle and, while I was impressed by the mechanics of the futuristic system, I was more impressed by the number of bicycles the facility could accommodate. Each day over 9,000 Tokyo residents park their bicycles at Kasai station. 9,000! The station is located in a neighborhood about 10 miles from the Tokyo city center and it’s become a major bike park-and-ride hub for commuters. I was pretty excited to go explore Kasai Station, but I’ll be honest, there really isn’t that much to see. The bikes, after all, are parked underground. Here’s what I did see. There are 50 small kiosks in an underground garage just outside of the train station where people slide a membership card through a scanner, load their bikes on a platform, and then watch their bike get sucked into the kiosk. 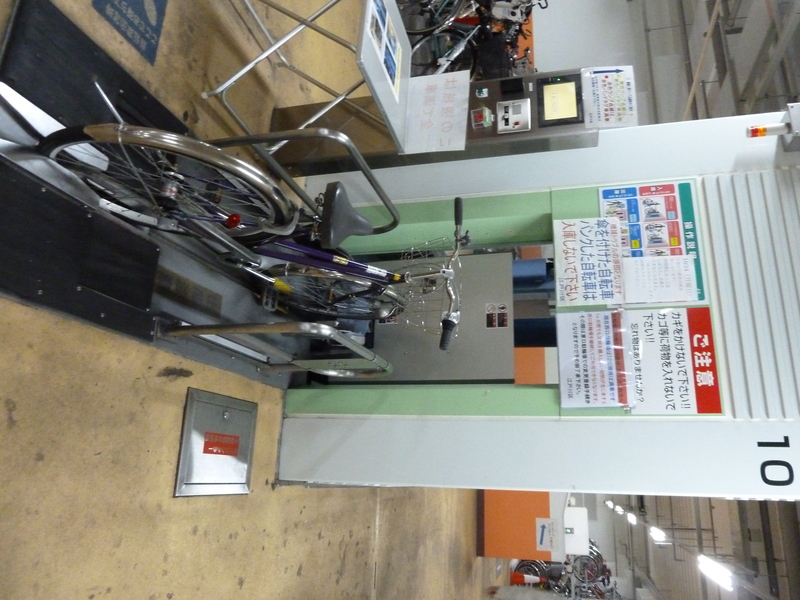 A mechanical lift then lowers the bike into an underground tower and deposits the bike in a space on a large vertical bike rack. 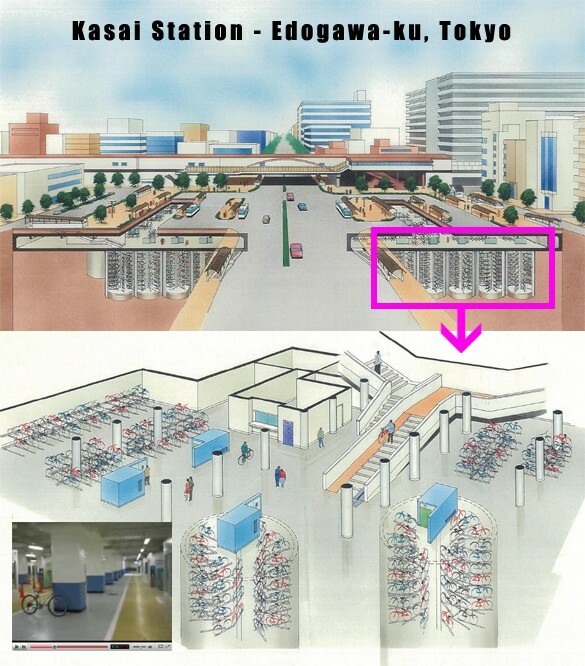 I could just barely look down through the windows of the kiosk to see where the bikes are stored below—and the pictures I took are terrible—but this image does a good job of showing the layout of the underground portion of the facility. People who were retrieving their bikes just slid their membership card through the scanner again and then their bike would come out of the lift approximately 23 seconds later. It costs 100 yen ($1.25 USD) per day or 18,000 yen ($23 USD) for a monthly pass. 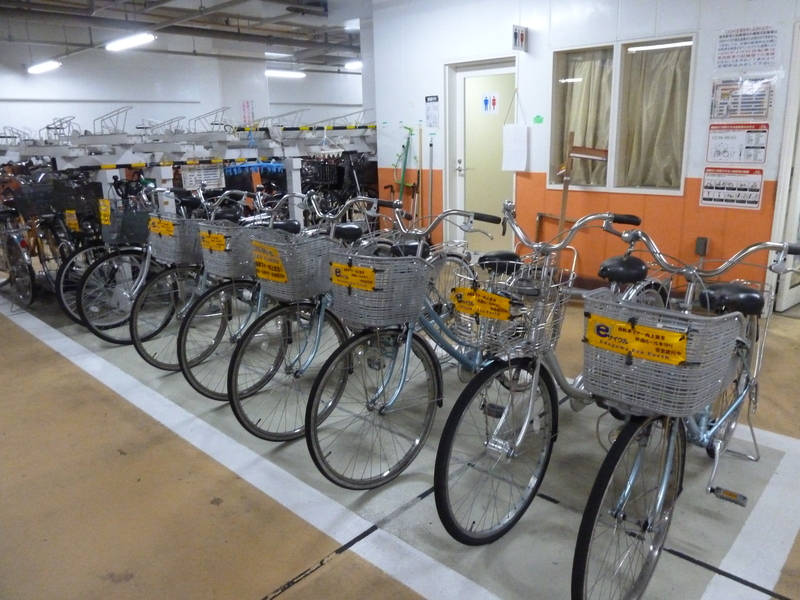 There’s also a privately-run bike hire program at Kasai Station. 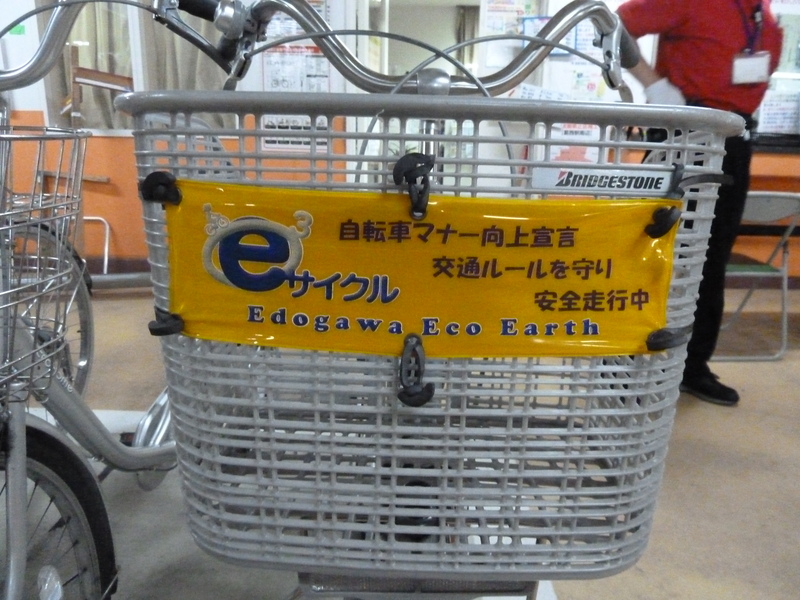 The company, called Edogawa Eco Earth, has several locations near Tokyo Metro stops that are on the periphery of the city where the density of Metro stations is lower. Having bikes for hire at these more “suburban” Tokyo Metro stations can solve several logistical challenges that would otherwise make car-free living slightly burdensome. For example, pretend you live on the other side of Tokyo and took the Metro to Kasai Station so you could have dinner at a friend’s apartment located about 1.5 miles from the station. You’d have a few options for how you could get from the train station to your friend’s place. You could walk the 1.5 miles (which would take about 25 minutes), take an expensive Tokyo taxi for about 800 yen ($10 USD) one-way, or rent a bicycle for the evening for 100 yen ($1.25 USD). Renting the bicycle is by far the most attractive option in my mind when considering time, cost, and logistics. Getting commuters to nearby transit centers without the use of a car is often called the “first- and last-mile problem.” Bikes are an obvious solution to the first- and last-mile problem, but commuters need to know that there will be safe and ample bike parking at transit centers before they’re going to start riding their bikes. Providing rental bikes at transit centers is also a great way to extend the range of a car-free commuter. 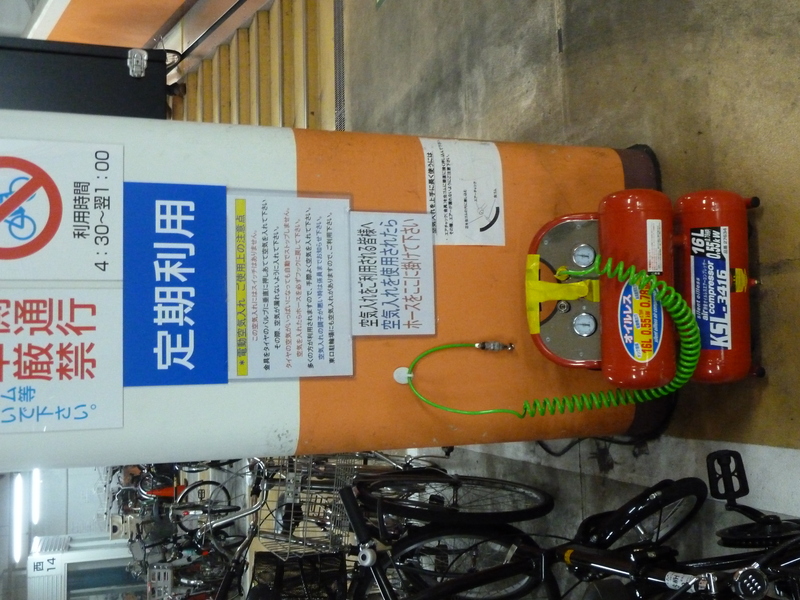 There were two other things I really like about the Kasai Station bike parking facility. 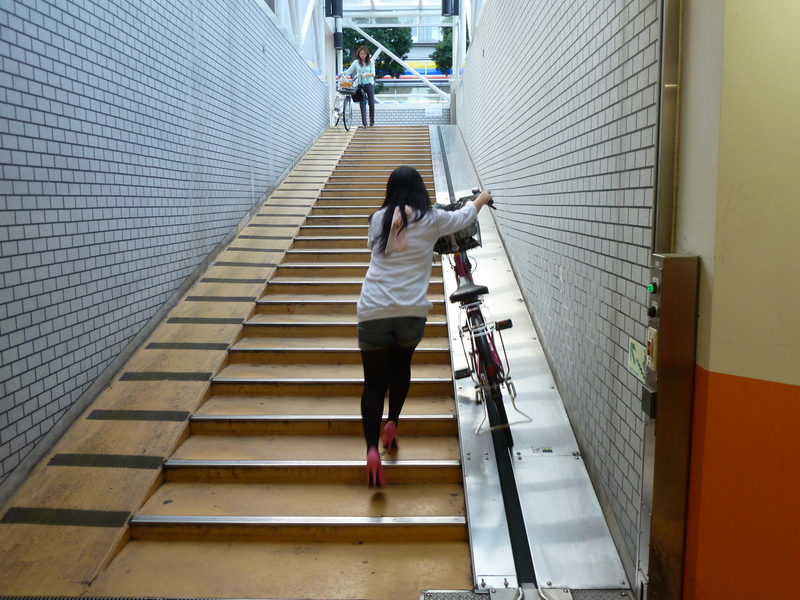 There are bike escalators. 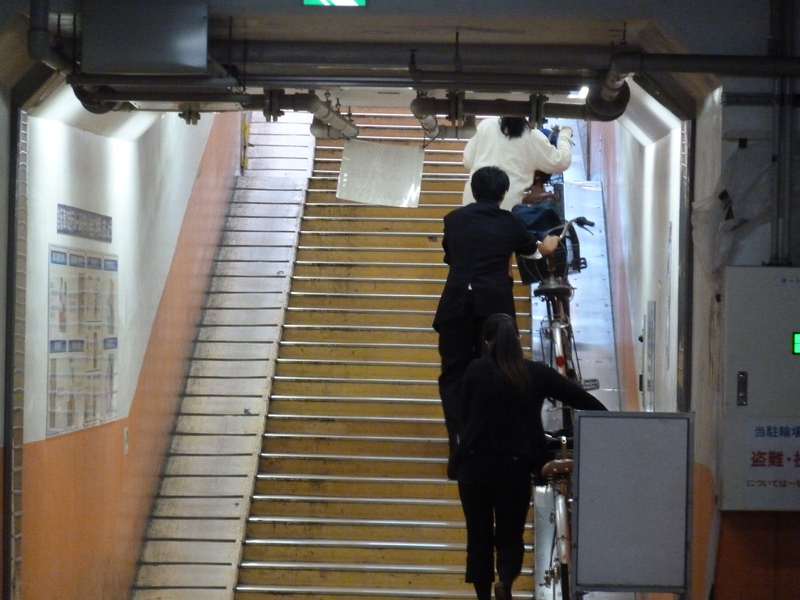 You climb the stairs while holding the handle bars of your bike and the escalator does the hard work. …and there is a really good bike pump.